Pub walks are not just about getting out into the open countryside, striding it out in the fresh, clean air before discovering a traditional village inn where one can sup a pint with the locals and relish traditional pub fare. Idyllic as this may be (albeit increasingly hard to find), there are other equally appealing ways to combine exercise with a classic pub experience. This London Pub Walks book certainly offers one such way. The Campaign for Real Ale (CAMRA), who have compiled this book, know a fair bit about great pubs of course. However, their new edition of London Pub Walks is about much more than simply the pubs, although there are nearly 200 of them featured here. They have also gathered a collection of 30 walks around the capital that provide true variety and interest for anyone fascinated by all that this city has to offer. Although some of the walks are circular, they also make good use of the underground network to avoid forcing people to double-back along what may be a less interesting route just to return to the starting point. One of the advantages these city pub walks have over their rural equivalents! Many of the walks are only 1 to 2 miles long, especially those in the heart of the capital, and this wont be much of a challenge for the serious hiker. However, there are some longer walks included too, up to 7 miles, for anyone feeling they need to work a bit harder to earn their reward at the pub! 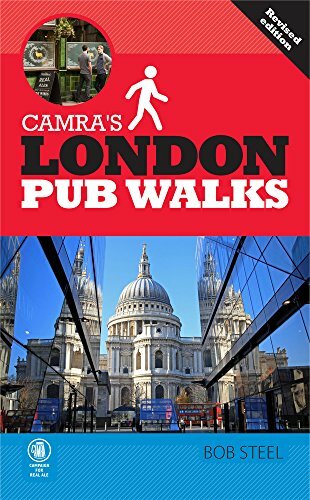 In any case, everyone knows that pub walks appeal to all ages and abilities and the routes in this book can be included as part of a day out in London or even added on to the working day. If you are after a challenging day's hiking then you are probably not about to head to a city anyway. The format of the book is high quality paperback with colour photos and maps throughout. Each walk has details of not only the pubs and key attractions with comment on points of architectural and historical interest but it also includes the important public transport information. To buy a copy for your own bookshelf simply click on London Pub Walks or the button below where you can get one at Amazon prices with free postage. If you are not already a subscriber to our free newsletter "The Pub Walker" then why not give it a try and find out more about pub walks in your area. Register to receive "The Pub Walker"for Free!